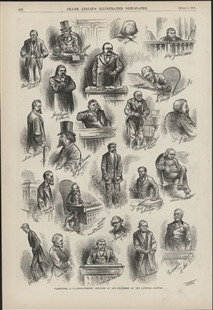 Published just one day after the Electoral Commission settled the disputed 1876 Presidential election, this montage of sketches includes several commission members as well as those who made remarkable statements throughout the process. 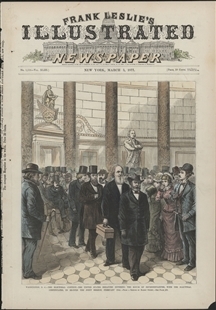 Henry Watterson—depicted here with a mild manner—had declared “Tilden or Blood,” in favor of the Democrat in the contested election, claiming that an army was prepared to march on Washington if their candidate was not declared the winner. Illustrations of amusing vignettes like this were a regular feature in this publication.